If you had a birthday over the last day or so and you want to be a children’s book author, you have good company: Yesterday was the birthday of Louisa May Alcott (Little Women), Madeleine L’Engle, and C.S. Lewis. And today is the birthday of L.M. Montgomery (Anne of Green Gables) and Mark Twain. 1. Since it’ now officially the “holiday season,” I will tell you about my new favorite festive drink: Make an Old Fashioned, but use a clementine instead of an orange. Tasty! 2. Speaking of whiskey (and really, when are we not? ), the two cases of scotch under a hut used in Shackleton’s 1909 expedition are now a little less buried in ice, so the maker of the scotch wants to drill them out. Drill, baby, drill! I am thankful to have a job, and central heating, and things to read, and a clean cat. I won’t post tomorrow but I’ll have some things for Friday, including a Muppet video and some talk about whiskey. This week I stopped repeating the same part of the beige cardigan, finished the back, and got the sleeves sewed up, too. Now I just have the front trim and collar to do–I don’t think I’ll have enough yarn left for a belt, but I’m OK with that. And I’m planning an elaborate cabled sweater (Thing #22) to start before the year is out. I think I’ll use an Elizabeth Zimmerman pattern, who is famous for being an awesome knitter, yes, but for also coining the knitter’s equivalent of “Keep Calm and Carry On”: Knit on with confidence and hope, through all crises. The sky calls to us. If we do not destroy ourselves, we will one day venture to the stars. There was a time when the stars seemed an impenetrable mystery, but today we have begun to understand them. In our personal lives, also, we journey from ignorance to knowledge. Our individual growth reflects the advancement of the species. The exploration of the cosmos is a voyage of self-discovery. 1. The documentary Grey Gardens showcases some of my deep-seated fears (being old and poor, becoming dependent on someone else, turning into a crazy cat lady), so I had some reservations about watching the HBO film about the same characters, but it was very good. I recommend it, if only to better understand how crazy cat ladies get that way. 3. And finally, here’s a map of Holme’s London, with notes about what adventure happened in each mapped point. It’s very thorough. 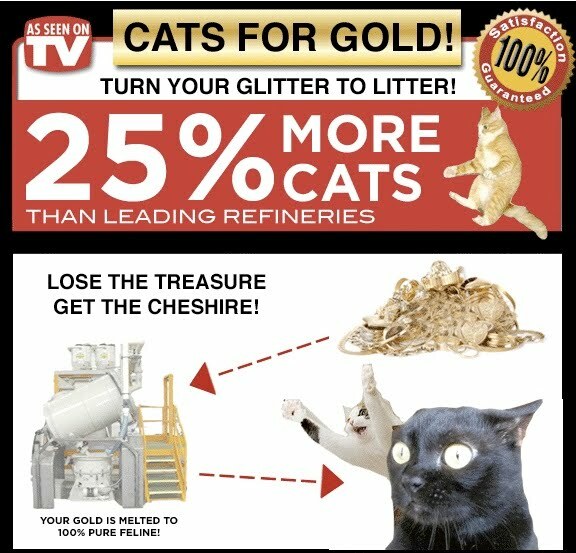 You’ve probably heard of Cash4Gold, but have you heard of Cats4Gold? They can help you with small home improvement tasks, such as putting in a new shelf and re-organizing your broom closet. Yeah, this shelf is solid, mama. And they can inspect your cooking utensils, so make sure they’re all OK. Uh, this one has a smell. After I put up a picture of the in-progress cardigan/vest two weeks ago, I noticed I’d gotten off on the pattern on the left front about six inches from the top (it looks like a bumpy line on the right side in that photo). I debated just leaving it, but the point of hobbies–besides being relaxing, of course–is that I’m in control, dammit, so I ripped back and started that part of the front over. Except the second time I tried to do it, I got it too long and had to rip back again; and the third time, I made the same mistake and had to rip back one more time. The fourth time was the charm, though. So two weeks later, I’m essentially at the same point. But it’s mistake free! 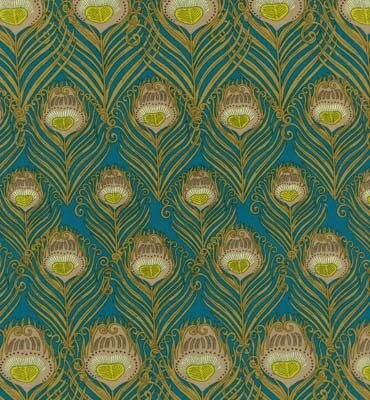 In other news, I’m making a dress out of this fabric. It’s a pattern I’ve made about 6 times, so I’m not too worried about messing this one up. "…my heart is closing like a fist…"